March 20, 2017 – The Kristin M. Callahan Foundation has donated an Automated External Defibrillators (AEDs) to the new North Andover High School. This device will be housed at the track, and will be available for most school sports activities. December 27, 2016 – We have made a $2,500 donation to the HCM Clinic in Boston. Soon, the HCM clinic will have an expanded, dedicated space, along with some of the best doctors in the country working solely on HCM. We are excited to support them as they continue their excellent work. October 5, 2016 – We have donated two portable defibrillators to NRHS. These two devices will replace the original devices that we donated in 2009. We are pleased to report that after seven years they never needed to be used. We sincerely hope that this continues to be the case for these new AEDs. May 3, 2016- The Kristin M. Callahan Foundation has donated an Automated External Defibrillators (AEDs) to the Little School Softball Field in North Reading. December 15, 2015 – We have recently made a $10,000 donation to the HCM Clinic in Boston. One of only a few clinics in the country focused on HCM, we believe that supporting this facility is an important part of our mission. October 13, 2015 – The Kristin M. Callahan Foundation has donated three Automated External Defibrillators (AEDs) to the North Reading Middle School. With the combination of the NRMS and NRHS into the same building, there are now 7 AEDs available in case of emergency. December 2, 2014 – The Kristin M. Callahan Foundation has recently donated four Automated External Defibrillators (AEDs) to the new North Reading High School. According to the American Red Cross, “sudden cardiac arrest is one of the leading causes of death in the U.S. Over 350,000 people will suffer from sudden cardiac arrest this year, and it can happen to anyone, anywhere and at any age. An AED is the only effective treatment for restoring a regular heart rhythm during sudden cardiac arrest, and is an easy to operate tool for someone with no medical background.” While we certainly hope that devices are never needed, we’re also honored to help make NRHS just a little bit safer for its young athletes. August 13, 2013 – We have recently made a second $10,000 donation to the HCM Clinic in Boston. One of only a few clinics in the country focused on HCM, the doctors are making great strides in understanding and treating HCM. We are excited to be a part of this research, and thank everyone who has made this donation possible. July 15, 2012 – Thanks to the generosity of our supporters and corporate sponsors, the Kristin M. Callahan Foundation was able to make a donation of $10,000 to the HCM Center at Tufts Medical Center in Boston. This is the first clinic in the northeast focusing on Hypertrophic Cardiomyopathy, and has made huge strides toward both understanding the disease, and toward treating those affected by it. We cannot say enough about the work they are doing in helping those living with HCM, and this is only the beginning of our support for them. 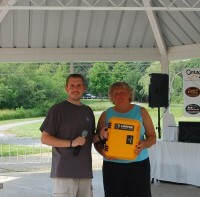 June 23, 2012 – The Kristin M. Callahan Foundaiton has donated a portable defibrillator to the Ipswich River Park in North Reading. The defibrillator will be stored near the sports fields, and will be immediately available if it is ever needed. Given the number of sports that take place in the park, we are proud to have been able to take this step toward protecting young athletes. 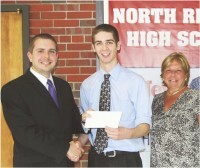 June 1, 2012 – We are proud to announce that we have awarded the first Kristin M. Callahan Foundation Scholarship to a graduating North Reading High School Senior. The deserving student will be attending Carnegie Mellon University in the fall, and we hope that our $1,000 scholarship helps him as he works toward academic success. May 25, 2011 – The Kristin M. Callahan Foundation has donated a portable defibrillator to the North Reading Little League. The defibrillator will be housed at the Little League Field on Central Street in North Reading, and will be available in case of any emergency taking place there. As with all of the defibrillators we have donated, we hope that this one will never be needed. We are very aware, however, of the importance of these devices in saving the lives of young athletes, and we thank all of those who have donated for making this possible. December 1st, 2009 – We are proud to announce the donation of two portable defibrillator units to North Reading High School. One of these units will be housed in the gymnasium area of the school, while the other will be used primarily for outdoor sports and other activities.